Join award-winning woodcarver Desiree Hajny as she reveals her artistic approach to carving North America's most exciting predator. Desiree is well known for her lifelike richly detailed animal carvings. Now she shares her knowledge and carving secrets with you in this handy reference guide. Celebrate the natural beauty of wild bears as you create your own magnificent woodcarvings. 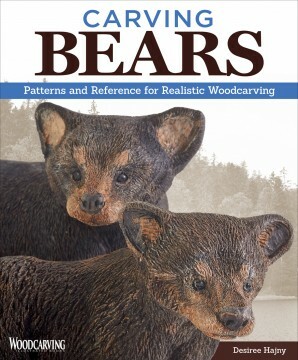 Inside you'll find ready-to-use patterns for carving black bears and grizzlies. Clear reference photos provide inspiring views of bears from all angles and color-coded anatomy sketches help you to understand how they move. The author offers expert tips for carving challenging details like eyes nose ears and paws along with texturing painting and finishing techniques.